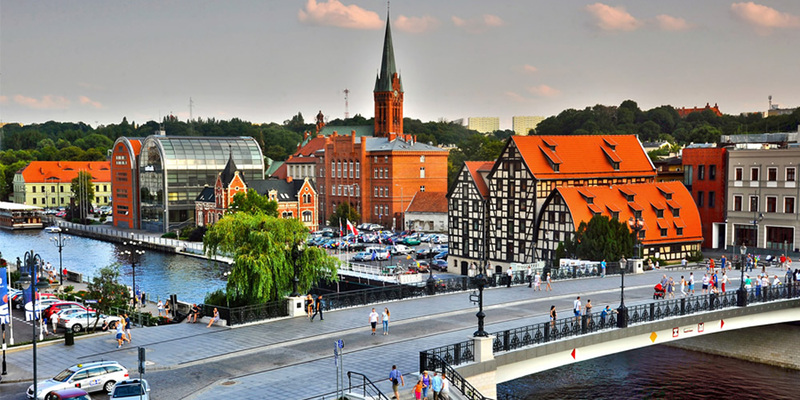 Bydgoszcz, the capital of the Kujawsko-Pomorskie province is one of the most important economic and educational centers in Poland with three state universities and sixteen other colleges. The city is home to many international concerns that deal with the banking, electrotechnical industry and telecommunications. Owing to its picturesque location on the Brda River and the historic Bydgoszcz Canal, as well as the Vistula River, the city has earned the name of the biggest Polish centre of inland navigation. One of the most unusual and enchanting places in Bydgoszcz, famous for its wharves, cascades and weirs rustling water is Mill Island. Because of the unique location, this area gained the nickname of Little Venice. Ubiquitous green areas are part of the city image. Bydgoszcz is often called a green or a garden city. It owes this title not only to the parks, old avenues of trees within the city, but also to the Myślęcinek Forest Park on the outskirts; its 800 hectaresof forest include the Polish Fauna Garden,one of a few in Poland, a botanical garden, an Alpinarium, an equestrian centre and tennis courts, just to name a few. Today the city, with its population of nearly 400 000 people, is an industrial, commercial, cultural, educational and sports centre. One of its strongest points is also the fact that it is an important road and railway junction and inland harbour as well. The modern international airport with regular connections to Warsaw, London, Dublin and Liverpool has been in operation since early 2004. The city boasts a vibrant economy with about 48,000 foreign and domestic firms. New technology companies dominate, representing sectors such as electronics, telecommunications, food processing, chemicals, engineering, furniture production and printing. The city also houses NATO Joint Force Training Centre. Bydgoszcz is a city of culture and music. Two national stages operating here (the Pomeranian Philharmonic and Opera Nova) create together with Academy of Music so called music district. In addition to concerts and spectacles, these institutions organise international festivals and competitions. Enthusiasts of good music will certainly find something of interest in the numerous clubs and pubs. Sports have always been a major part of the city life. Over thirty sports and leisure clubs offer athletics, basketball, football, rowing, canoeing, volleyball, chess, speedway and many more. Many Olympic as well as World and European Championships medallists come from Bydgoszcz. In July 2008 the city hosted the World Junior Athletics Championship. Organisers of international sports events, regard Bydgoszcz to be a city of efficient and professional work ethics. For the last ten years, Bydgoszcz has held the speedway Grand Prix competitions, and co-organised the European Athletics U23 Championships (2003) and the SPAR European Cup (2004). Water sports, canoeing and rowing,with a pre-war tradition, constitute one of its trademarks. Men basketball, women volleyball and Volleyball World League competitions, held in a top-class entertainmentand sports hall, attract crowds of devoted fans. Visitors to the city, fair, sports and cultural events guests find hotel accommodation easily. Local restaurants offer foreign cuisine and provide excellent service.